All the projects featured in this article have been chosen for the particular qualities of each piece of timber. 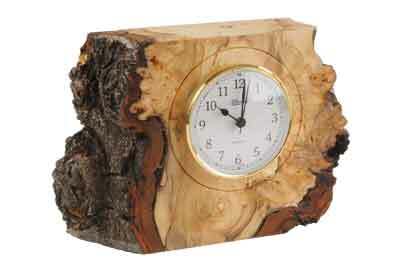 I have tried to show a variety of items that can be made from pieces of log, using their natural edges as a feature. Some are end grain turned and some turned in bowl orientation. 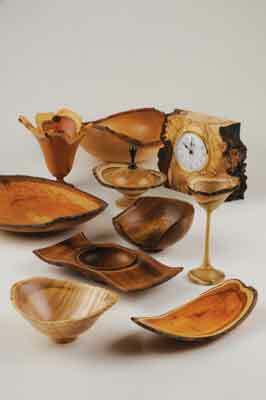 The contrast between bark, sapwood and heartwood adds character to the pieces. When selecting a log, I don't think it is always necessary to have the bark intact; you can leave the bark on or remove it depending on your individual tastes. Natural edge turning is a challenging but enjoyable turning experience. See health and safety tips opposite before starting these projects. 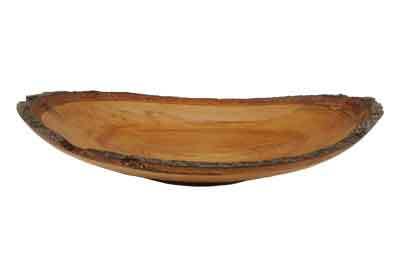 Branch wood and small logs are a perfect selection for this bowl; the contrast between the heartwood and sapwood can be striking and when the bark stays in place, the results can be very pleasing. 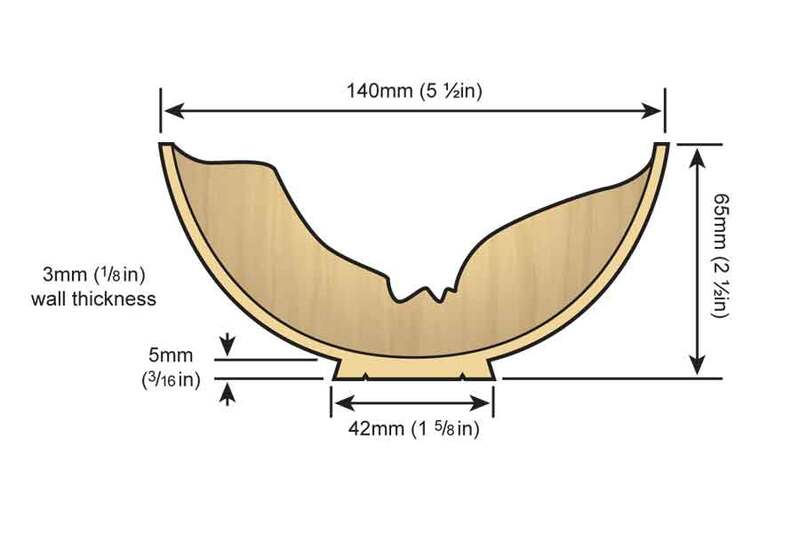 The log used for this bowl is 216 x 36mm diameter and needs to be cut in two, lengthways, using a bandsaw. The freshly cut surface becomes the underneath of the bowl. For mounting on the lathe a hole is drilled, into the bark, using a Forstner bit the correct size for the chuck. Due to the size of drill bit being used and the relatively small piece of wood, you will need to clamp it securely to the pillar drill bench to stop it from moving and potentially putting your hands in danger of being caught in the revolving drill. it up. Lastly, you need to apply several coats of oil to the bowl until the required finish is achieved. and approximately 105mm thick. 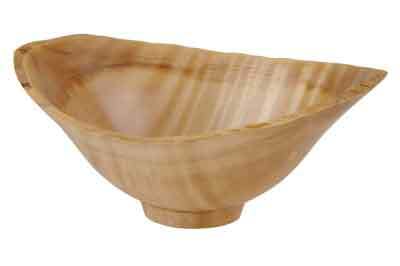 This is a lovely bowl to turn and finish, but like all pieces of wood, they have their own character. The piece I turned had a dead knot right in the bottom of the bowl, which would have fallen out when the chucking point was removed; I secured it in place with crushed bark mixed with Cyanoacrylate. This method is very effective for filling in gaps, cracks etc. Start by mounting the timber on the lathe using the same method as for the other pieces: a recess drilled with a Forstner bit. 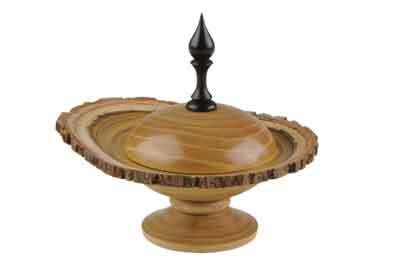 Once the bowl is turned, sand to a finish, and any dead knots can be filled and sealed. Mount it on a vacuum chuck to remove the chucking point, finish the foot, then apply several coats of oil. 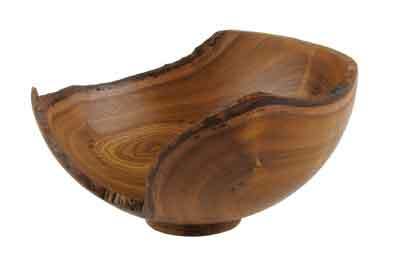 This particular bowl is turned from a piece of sycamore (Acer pseudoplatanus) log that measures 159mm diameter and 65mm thick. On the piece I used, the bark was completely missing and the rippling was clearly visible. 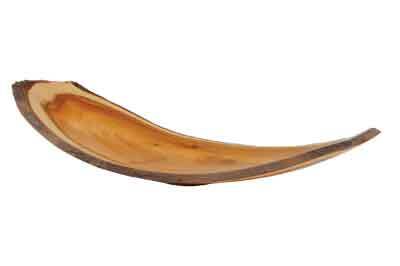 Sycamore, in my opinion, is an easy wood to turn and finish. 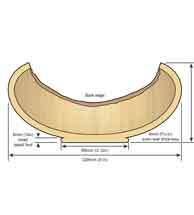 To begin this project, you need to start by mounting the bowl blank on the lathe using a Forstner bit hole, which needs to be drilled the correct size for your particular chuck. I decided to make an ogee bowl which would be a nice size for use as a sweet bowl, for example, but there are myriad other uses. As with most natural edge turnings, a lot of hand sanding is required here. You could, if you wish, darken the natural edge to highlight the piece. Finish by applying several coats of oil until you achieve the finish you desire. 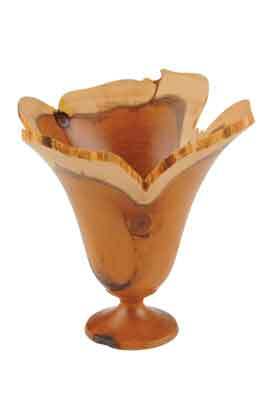 Unusual shaped pieces of timber tend to be overlooked, but can produce some unique turnings. 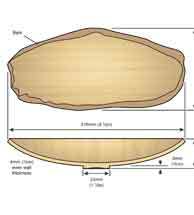 The piece of laburnum (Laburnum anagyroides) I used measured approximately 140mm diameter x 70mm thick and resembled a croissant, which was difficult to mount on the lathe. The area required for drilling, either for a screw chuck or Forstner bit hole, was where the missing section began to taper, so I mounted the bowl blank between centres to cut a chucking recess on the underside. For this I used a Steb centre in the headstock and a revolving Steb centre in the tailstock. Mounted in this recess the bark in the centre is turned away so a spigot can be cut. This done, the rest of the bowl is quite straightforward. There was a large gap in the timber I used, but with the lathe speed set as fast as possible, this became almost unnoticeable. For the foot, cut a chucking spigot the optimum size for the chuck. This spigot can be left on or removed; however, if it is, any marks left by the chuck can be removed with light hand sanding. 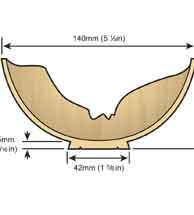 The bowl is turned to a uniform wall thickness of approximately 3mm and sanded, as described, before applying several coats of oil. a chucking recess needs to be drilled with a Forstner bit. The bark on beech is very thick so some of the area around the chucking recess may need to be flattened to allow the hole to be drilled deep enough. To avoid reducing the height of the platter, a chucking recess is used for remounting. 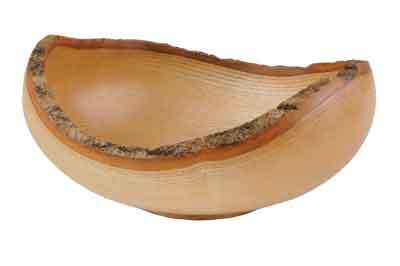 Some of the bark may loosen when the inside of the bowl is being turned, in which case, secure in place with Cyanoacrylate before taking the final cuts. The chucking recess is removed by mounting on a vacuum chuck and several coats of finishing oil are then applied to finish. Acacia (Umbellularia californica) has a very coarse bark with pale sapwood and beautifully ringed darker heartwood. 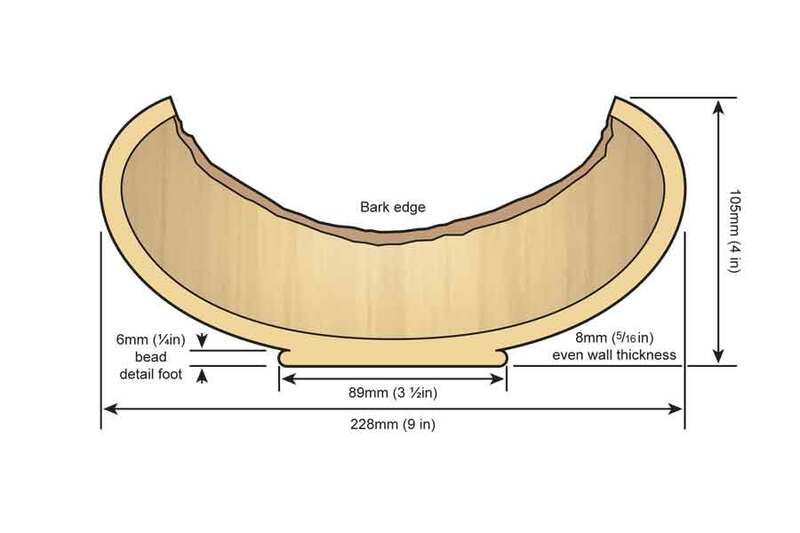 The log used for this project is 150mm long and approximately 89mm diameter, and needs to be uniform along its length. As the goblet cup is a long way from the headstock, use shark jaws for a more substantial hold. 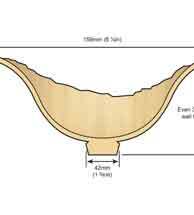 Bring the tailstock up for support and turn the outside shape of the goblet cup first, and then turn the inside profile to match. 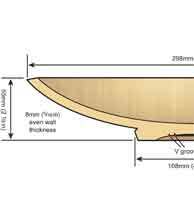 Although the log was of uniform size the natural edge rim is still irregular and shows the timber off to its fullest. Any loose bark can be secured with Cyanoacrylate before taking the final cuts. 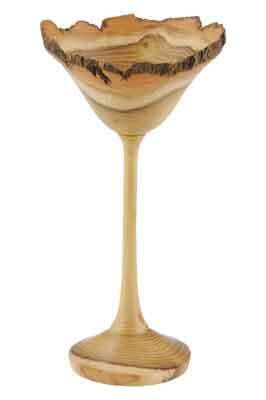 Sand the goblet to a finish before removing any of the remaining bulk. Carefully hand sand in the direction of the grain, taking care not to loosen or break off any bark. 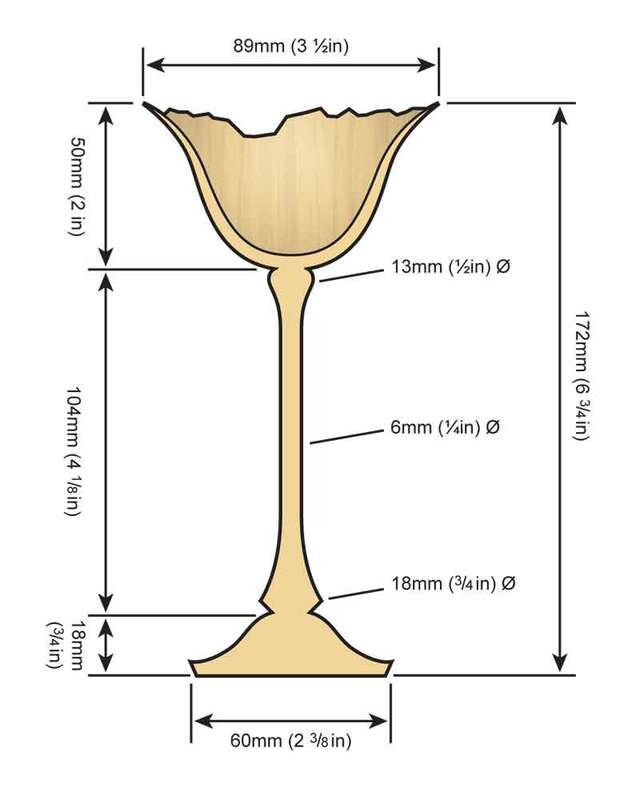 Work down the stem approximately 25mm at a time whilst the cup is steadied by the taildrive. Use a piece of dense foam or something similar to stop the taildrive point from damaging the timber. The bottom section of the stem is slightly thicker than the top. 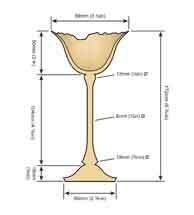 For the foot, turn a slight ogee shape to match the goblet cup. The project is finished with two coats of sanding sealer followed by several thin coats of melamine lacquer. You will need a piece of yew (Taxus baccata) log that measures 152mm diameter x 190mm long for this project. Due to the length of timber, use shark/gripper jaws as they offer more substantial support for this type of end grain turning. Cut a chucking spigot the correct size for the jaws and with the tailstock brought up for support, the top three quarters of the outside profile can be shaped and hollowed out, working an inch at a time. 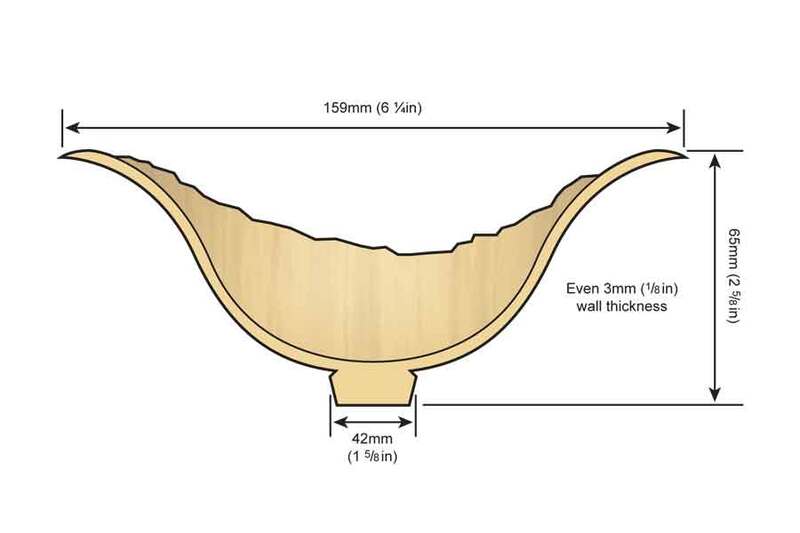 Shape the remaining profile and hollow to an even wall thickness. Sanding of the solid body is done with the lathe revolving; however, the irregular edges need to be sanded by hand, taking care not to create too much heat, due to potential heat shake occurring. Several coats of oil are applied and the piece is then buffed to a shine. Laburnum is dense with relatively smooth bark. 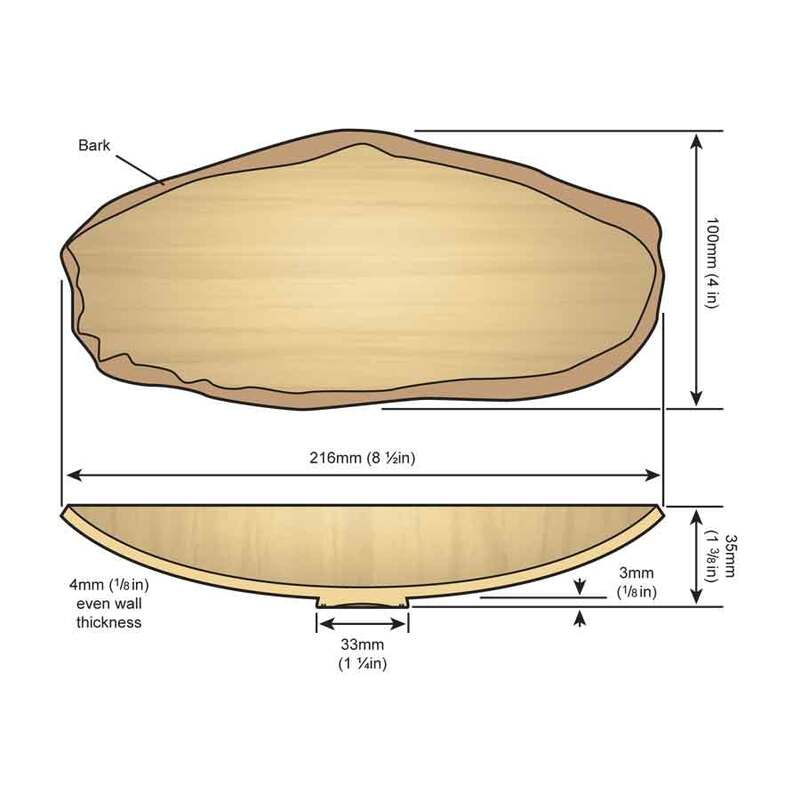 You need a laburnum log measuring 125mm diameter x 230mm long. Cut it in half, lengthways, and drill a chucking recess into the flat, freshly cut surface. The half log is clamped onto a 'V' block lined with a piece of non-slip router matting to give more stability and is then clamped to the drill bench. Mounted on the lathe, the underneath is turned with the lathe speed set to the highest speed you and your lathe are comfortable turning at. With the log being a great deal longer than it is wide, there will be a lot of ghosting to contend with. As a visual aid, mark the toolrest where the longest length starts. A spigot, the optimum size for your chuck, is used for mounting. This spigot can also be used as the foot; a gentle sanding may be required to remove any signs of chucking. A lot of hand sanding is needed before applying several coats of oil. which would have been turned away, so I cut the burr off and turned a small dish from it. The remaining piece measured 159mm long x 216mm wide and had two flat edges, so I chose to make a mantle clock from it. If you have a thicknesser, run the piece through to produce a uniform thickness. True up the top and bottom using a bandsaw and sand on a belt sander, making sure they do not rock when sat on a flat surface. The centre of the clock position is marked and the timber mounted on a vacuum chuck using that mark as the centre. The recess to receive the clock is cut and a decorative 'V' groove approximately 6mm larger than the clock diameter needs to be cut as proof the timber has seen the lathe! This surface is sanded by hand, taking care not to round over the edges. Alternatively drill a recess, the correct size for your chuck, in the back face and mount on the lathe. True up the front surface, taking care not to round over the edges. Cut a recess to receive the clock insert, the 'V' detail, and sand as described above. If you have the correct size jaws, the clock recess can be used to reverse mount the timber to face up the back and remove any evidence of chucking. Two coats of sanding sealer are applied and, once dry, buffed to a shine with paste wax. 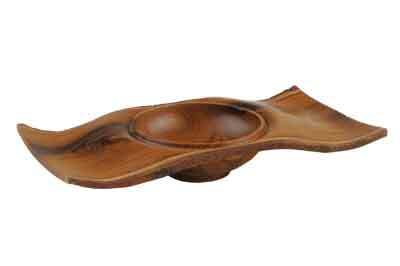 This item is turned from an end grain log approximately 150mm diameter x 125mm long. Mount the log between centres and cut a chucking spigot at both ends then, with one mounted in the chuck and the taildrive pulled up for support, the top one-third is parted off. The bowl of the pot is turned flaring into a thin, bark edged rim and a recess cut to receive the lid. The lid is turned to fit and sanded to a finish. Prepare a jam chuck and fit the lid for removing the chucking spigot and refining the shape. Drill a hole to receive a finial, which is turned from contrasting timber. Part off the base of the pot using a fluted parting tool to minimise grain tear out. To finish, two coats of sanding sealer are applied and once dry, buffed to a shine with paste wax.